Is is time to redo your bathroom? Then freshen up the walls with some new paint or wall paper and decorate with natural wicker furniture to give your bathroom an elegant feel and look. Bathroom decorators have used wicker cabinets and accessories to decorate bathrooms for years. Decorating with wicker gives your room an elegant warm feel. Here is what you need to do to get started designing your new bathroom. Start by browsing through some magazine catalogs or on-line wicker stores for some inspiration on the decor you would ultimately like to reach. Look for floor cabinets for storing towels and bathroom supplies. Some cabinets will have only doors where others will have drawers and doors. Floor cabinets are really neat because they can be easily moved around in the room to provide a new look. Moving them also make it a little easer to clean the area below and behind the cabinet. If the height of the shelves inside the cabinets are important to you, then you should further investigate the available heights. Some cabinets have fixed shelves and others may have adjustable ones. Consider what you need at hands reach. Wall cabinets or wall shelves are great wall decor pieces that provide both pleasing aesthetic value as well as functional use. There are a variety of wall cabinets with top and bottom shelf options as well as shelves behind the medicine cabinet doors. Some even have a fowl bar. For small space baths, these wall cabinets are great space savers. Wall shelves present a great artistic tough to any bathroom. Whether you use it to hold toiletries or decorative knick-knacks and photos, wall shelves round out a room. Wall shelves are available in one, two and three tier shelf styles. Choose one that is right for you and your space. Some collections may have their own design style such as Florentine or Regency. What about the sink cabinet? 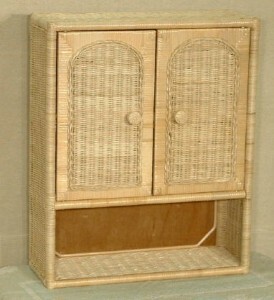 Well, there are not many manufacturers that offer wicker sink cabinets. But if you are handy, you can add wicker webbing with a trim piece to existing cabinet door panels to convert your existing cabinet to one with a wicker accent. There are several suppliers of wicker webbing that can be found on the internet with wide selections of webbing. Once you have picked out your furniture, get started. Remember, adding wicker to your bathroom will provide an elegant warm homey atmosphere. Choose colors that are right for you and don’t be afraid to repaint wicker to the color you need to make your bathroom gorgeous. Check back for our next article to learn about rattan furniture.